I have a 219Power AB and would like to figure out the simplest way to convert it to manual. I’ve sourced a carriage handle and am planning to have an adapter fabricated to attach the handle to the stub end of the carriage rod, but my question is aimed at the least-intrusive way to disconnect the carriage from the drive system underneath. I certainly don’t want to disconnect the drive chain (as I’d never get it back together), but I do want to disengage from the drive system to free up the carriage and reduce drag when operating manually. The goal here is to get it to manual, but also to be able to revert to power in the future. Also, how will this play into the motors (for carriage and ink drum)? Once I have the carriage disengaged, can I simply disconnect the wiring to the carriage motor? Or will this throw off the wiring to the drum motor? My plan is to run a phase-converter given that the entire thing is wired for 3-phase, although it will certainly be overkill to set up a converter just for the ink drum motor. But, as I say, down the road I may want to go back to the power carriage. It’s not simply a matter of dwell, it’s more about a preference for hand-control. Sure, automated presses can crank out thousands of impressions, but they’re not meant for fine work on handmade paper where haptic feedback and hand-control can make a big difference in print quality. The other issue is a matter of power: due to all kinds of headaches I’ve had no 220V power to my shop for over a year (in fact all I have is a small generator) which means my 219 has just been collecting dust. Had I gotten around to this conversion I could have been using the press all of this time simply by swapping in a standard motor for the ink drum. Thus, my desire to convert to manual is both personal preference and also practical. While removing the chain may be a relatively simple solution, I’m concerned about the fact that the carriage will still be “dragging” the power assembly. That is, there is a thin arm that connects the rotating gears to the carriage, and if that arm remains connected I would be moving all of that assembly underneath by hand. My goal is to figure out the least-intrusive way to detach that arm and thus leave as much of the drive assembly as possible behind and thus reduce drag on the carriage for hand operation. Let me preface my remarks with a note that I do not currently have a 219P to look at, although I have operated one in the past. I now have a Univ. III. But hopefully I can give you some things to check out. I personally believe there are too many advantages to having a powered carriage to eliminate its use, particularly if it’s conversion may be irreversible. 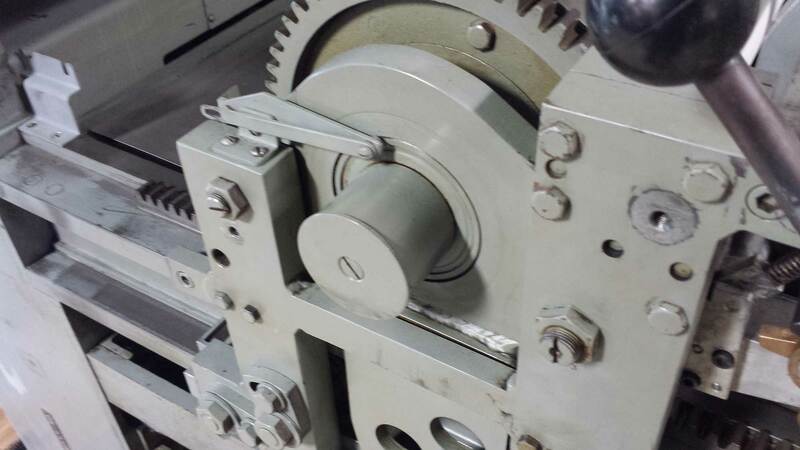 The gain in “dwell” is negligible with such a slow speed, consider automatic cylinder presses running at 3-4,000 sheets per hour, giving good ink coverage and impression. 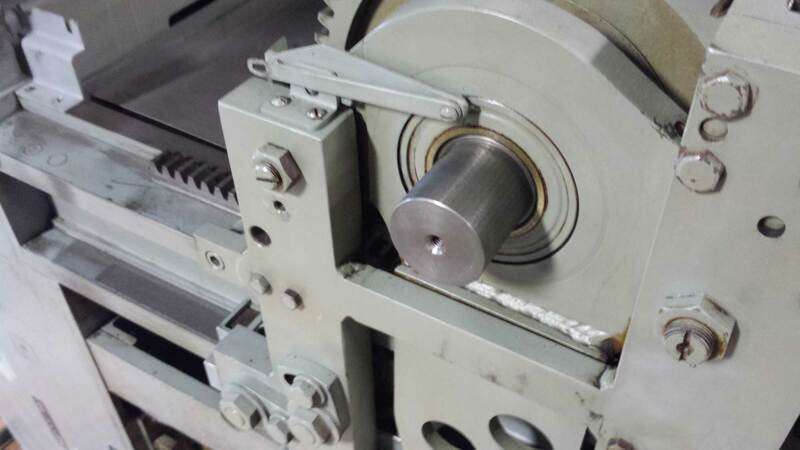 If set properly, the clutch will tell you if the load is too much for the form being printed. I would start with a check of the variable gearbox (or whatever transmission there is to vary the speed). It sounds like it is not operating well if you can’t get the press to operate at a lower speed. The original rating was between 9 and 18 sheets per minute. It is possible that the clutch is not set properly. If set too tight, you are not able to gain the torque required to move the carriage from a dead stop. As someone mentioned earlier, the chain removal should be a simple operation if you find the removeable link. It just requires a needle-nosed plier to spread the link for removal. I don’t have power to the press right now and the carriage won’t budge from it’s current position at the feedboard. In order to see what I need to do underneath I need to get it to mid-bed. Anyone know a trick for making it manually moveable while it’s still connected to the drive system? Let me know how the drilling into the stub goes. That is interesting about the need for slow printing. I imagine that the difference is not “dwell” so much as the speed of the carriage hitting the ink harder and squeezing it out more. I had another look at the stub, etc., today and realized that I already have two of the pieces I’d need. The sleeve and end-cap for my stub would serve nicely as the first two parts of the adapter (see photo). At the moment they are separate pieces, but if welded together they would provide a surface for a new rod to be welded on for the handle to mount to. However, this would make these parts permanently secured to the adapter and thus the outer casing that covers the carriage would no longer fit if I wanted to go back to power operation. Therefore, my plan is to do as you suggested and have the adapter milled from a single piece of steel rod. I’ll then have a hole drilled and tapped into the sleeve to go over the stub, and another hole drilled into the rod for the handle. The trick will be drilling into the stub, but I’ll deal with that when the time comes. As for why, as you mentioned I miss the haptic feedback as it tells me a lot about how much impression I’m getting. I also like to control the speed manually as some forms of type, I find, require a different amount of “dwell” than others. My standard printing practice, for instance, is to keep my ink light and my rollers nice and high and run one pass in Trip, then a very slow pass in Print. I find this gives me a very clean impression. All of this (the haptic feedback and manual speed control) is lost in Power mode (and I also find that the press simply won’t run in Power mode at a slow enough speed – it practically insists on racing back and forth, regardless of settings). That’s too bad you don’t have any holes in your stub, I was hoping that you would be able to try my jig idea. It looks like you have a decent amount of clearance for collar that goes over the stub. On the Uni I there is not much. To not have to worry about fixing the electrical components, especially if that would mean the press is down for a long time while it is fixed. And to get haptic feedback about the amount of impression from the handle. Is there a reason you are thinking of welding the two pieces to a steel plate? Would it be easier for a machine shop to just make what you want out of one piece on a lathe? Both the existing stub and the one for the handle would be much easier to have concentric, which might be trickier to do with welding them together. I’m not a machinist though. Have them put a hole to act as a drill bushing in the adapter along with a threaded hole so that you can fix the position of the adapter when you drill a hole for a pin. A separate piece just to drill the holes needed in combination with the adapter, maybe it is easier to get it braced, as you could even then drill into the end of the stub which would hold it more securely than a set screw. A separate piece to to drill a hole in the stub, with a matching threaded hole in the adapter, so you could use a machine screw as the pin connecting the adapter to the stub and not have to worry about it falling out. Regarding the chain, it is installed with no slack whatsoever, so my reluctance to pull the pin on one of the links is the potential difficulty of ever getting it linked back together. Also, the “arm” that connects the carriage to the revolving chain would still be in play, which will simply be extra weight and drag when operating the carriage manually. Thus, the simpler idea seems to be to disengage that “arm” where it connects with the carriage itself, so that all of the drive assembly is left untouched, and the carriage itself sheds as much baggage as possible. Daniel, as for the handle, the bore on the handle I found is too small for the diameter of the carriage rod “stub,” and my stub doesn’t have any holes I can use for a bolt/pin. My plan is to have an adapter made that will slide over the stub end, and will have an extension of solid steel the diameter of the bore in the handle. I can then slide the handle onto that extension and secure it with a pin, and then (somehow!) drill enough of a hole into the stub to secure a bolt/pin there to lock the handle in the correct starting position. Here is a quick sketch of my plan for the adapter. I have no knowledge of your press – so start with that disclaimer. But if taking off the chain will accomplish what you want, it may be possible to do that fairly easily, assuming the chain is similar to a bicycle chain.There is a simple tool for removing a pin in the chain and then disconnecting it. I carry the tool with me on bike rides in my saddle bag. You might talk with a cycling friend or possibly your local bike shop to see if someone can help you. 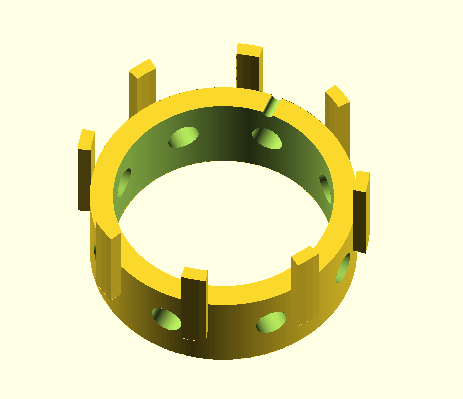 Here is an image of the 3d modeled measuring jig. I have powered Uni I that I have thought about converting to a manual press. 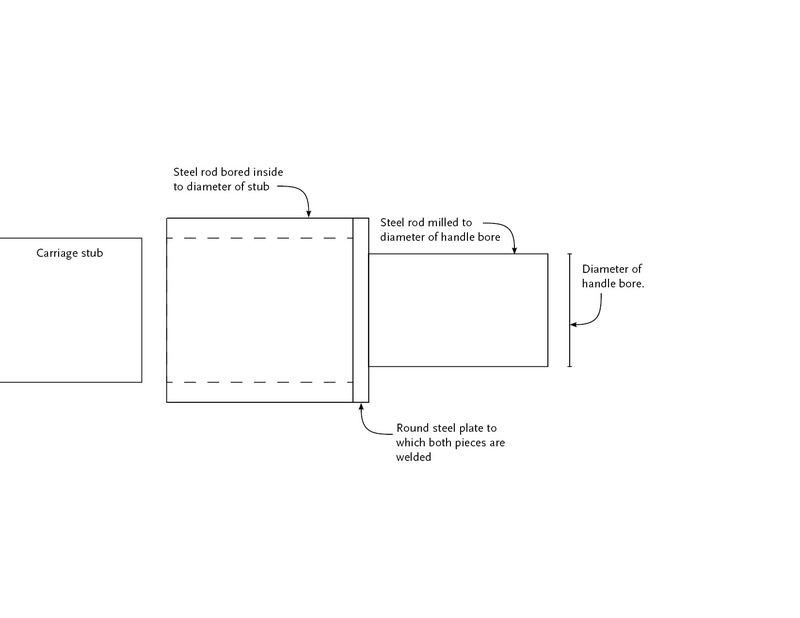 Do you know how you are going to attach the handle to the stub end? On my press the stub has two set screws approximately 90º apart on the stub, so potentially an adapter could be made that uses those existing holes. Or could also have one or two more holes that could serve as a drill bushing for drilling and tapping new holes into the stub, and the added holes could be widened and countersunk to accommodate a flat head screw. I tried to measure the angle between the existing screws carefully, using a ruler made on an image setter with .1mm increments, but it seemed like it was slightly off, so I also 3d modeled a jig with pairs of holes at angles close to 90º that maybe could help to get a more exact measurement. I added some spokes so that the closest measurement could be transferred to the adapter rather than having to rely on the 3d printing getting the angles correct. Ray: the Universal III conversion, discussed here, is not quite applicable. On power carriage Universals the cylinder gear is meshed with a gear/clutch connected to the carriage motor. 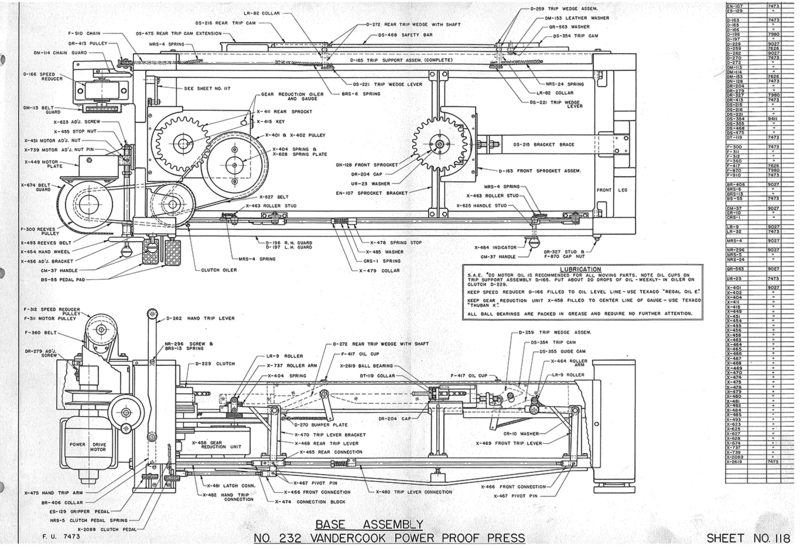 Previous to the Universal series, power carriage Vandercooks, such as the 219, were driven by gears and a chain under the press bed and connected via a belt to a motor under the feed board. Jason: the 219 manual I have doesn’t show a drawing for the power carriage assembly. (If your does please send it to me.) In its stead I’m posting a drawing for the similar 232 P. I will email a high res PDF. I haven’t done a 219 conversion, but think that you can start with removing the belt. clean and lubricate the chain and gears in place as best you can. The chain will have a master link and that should be enough to reduce resistance. Note also that there are bearings which roll on a center rail on the underside of the bed. I have a friend that did this to a Universal III. I’ll pass your note along to him and see what he thinks. Copyright © 2019 Vanderblog. Powered by WordPress. Theme: Ample by ThemeGrill.